We have an older yet remarkably well-preserved Blessing B-88-O large bore open-wrap F attachment trombone outfit here. It is American-made, the original case is in very good condition (one or two blemishes), the slide works very well, and the finish is good. The lacquer is only slightly/evenly darkened with age. 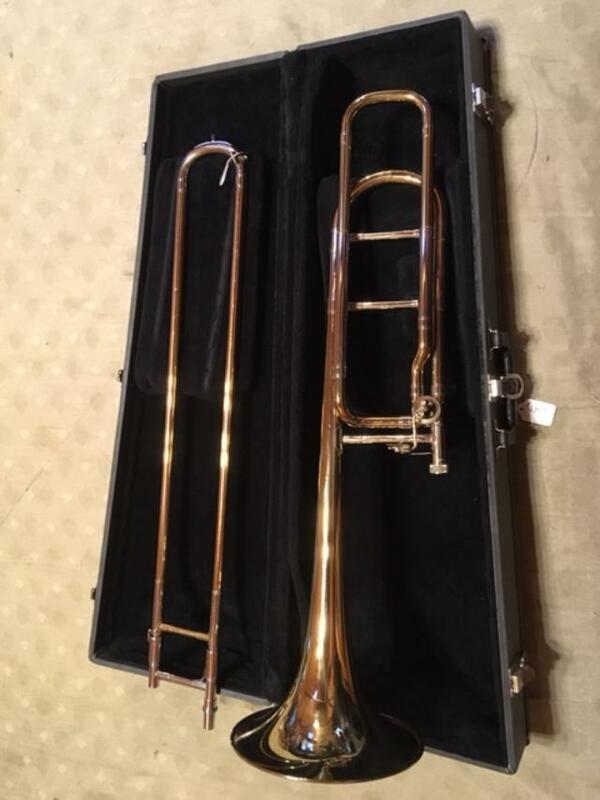 These instruments reference Conn 88H trombone (.547" bore / 8-1/2" bell), and the open-wrap versions of their F-attachments are somewhat similar to the Bach 42 open-wrap F-attachments. The bell (more like Bach 42, again) is yellow brass, and the outside slide tubes (like Conn 88H) are red brass (which should not ever red-rot). Towards the end of the USA manufacturing, there were some things that I personally viewed as cost-cutting measures. Again, this is an earlier-made open-wrap instrument, with the only cost-cutting feature on this one being a plastic cork plate (similar to those corkplates F.E. Olds manufactured, back in the 1970's). Blessing - made in USA - is now shuttered, and all the Blessing instruments are now Asia-made. We'll take $695 (plus ground shipping or postage) for this outfit. If there are requests, I'll post pictures. (Sometimes, stuff that I post here is sold before pictures are up.) I like to take pictures outdoors/overcast (easier to see details), but today it is raining. I have seen these offered for lower prices, but - often - those are bunged up and/or school salvage. This is in fine shape, and Indiana-manufactured. The case is the same as the last-generation (wood/UMI) case, with the only difference being that the Blessing case is grey/black, instead of (Conn) black/black. If the buyer is disappointed, we'll take it back if returned in as-sent condition, and to-the-buyer shipping costs are reimbursed. We'll cut the price down to $675 (plus shipping or postage) if you mail us a check. A personal check (or USPS money order, which is very low cost) is fine. You don't need to spend $5 or $10 (if your bank has fees like that) for a "cashier's" check. Last edited by bloke on Tue Feb 12, 2019 9:54 am, edited 1 time in total. These are good horns. I used one through grad school and my bone prof always complimented my sound. He said it played as well as his fancier brand name horn. And no this is not a paid advertisement. This instrument has been sold for the asking price.